Need an easy salmon dinner? Like – really easy, not “easy” then the recipe calls for twenty ingredients, half of which you’ve never heard of? Oh, or how about those “easy” recipes that require you to use every single measuring spoon, cup, bowl and every other utensil in your kitchen? Yeah, hard pass – if it’s going to take me longer to wash the dishes than it is to eat it, that’s not happening. So yeah – easy. And now that we’ve established just how easy my Easy Sheet Pan Lemon Sesame Salmon is, let’s chat about the dinner itself. First off – the flavors are super mild. The sesame adds a very subtle nuttiness that pairs nicely with the bright, fresh flavor of the lemon. A pinch of salt enhances all the flavors and that’s really all there is to it! There’s nothing wrong with letting the natural flavors of the food itself shine. Sometimes I think we all get caught up in needing crazy recipes, elaborate flavors, when really – when simple is done well, that’s all you need! 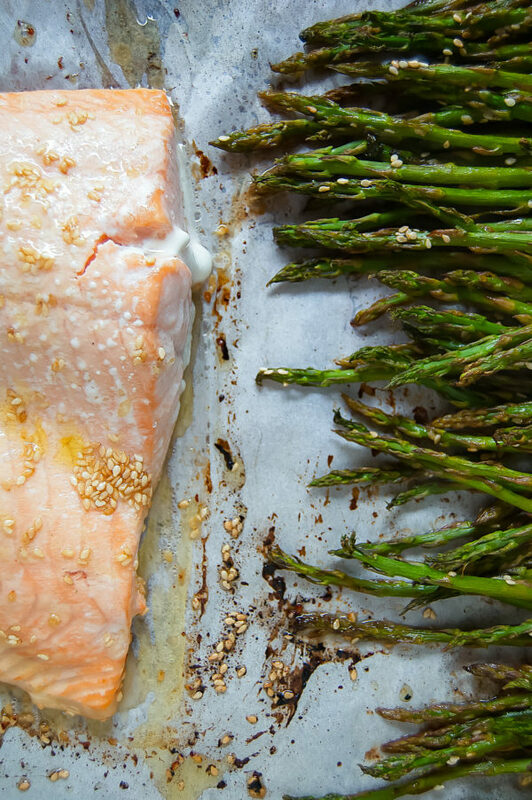 Which is why this Easy Sheet Pan Lemon Sesame Salmon is a new fave of mine. If you give this Easy Sheet Pan Lemon Sesame Salmon a try, be sure to share what you think! Leave a comment on this post, or share your thoughts on the NTF Facebook page. 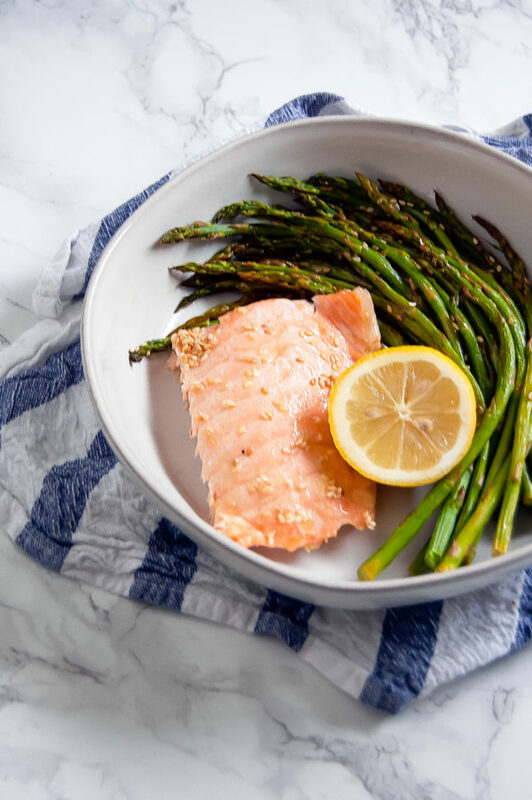 You also can snap a pic of your own Easy Sheet Pan Lemon Sesame Salmon creation and post it to Instagram – just be sure to tag me @nutritiontofit so I can see it, and use the hashtag #nutritiontofit so everyone can follow and see what the NTF community has been making! Live well! This Easy Sheet Pan Lemon Sesame Salmon is an easy weeknight dinner that takes under 20 minutes from start to finish to get dinner on the table! Preheat oven to 400 degrees. To help with easier cleanup, line a sheet pan with parchment paper. 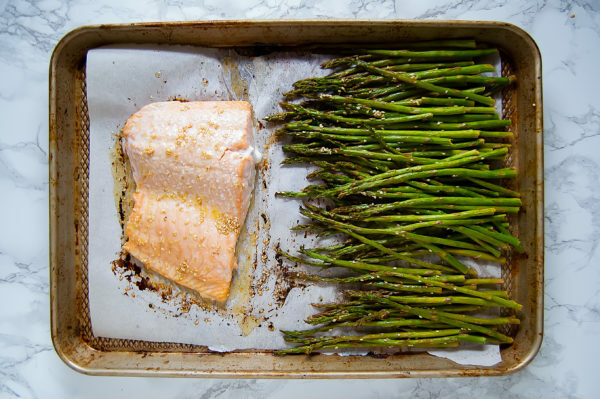 Place the large fillet of salmon on one side of the sheet pan (skin-side down), and the asparagus on the other side. In a separate small bowl, whisk together lemon juice, oil, sesame seeds, and salt. Evenly pour over the salmon and asparagus. Roast for 15 minutes. Serve immediately when done - may squeeze fresh lemon wedge over salmon. 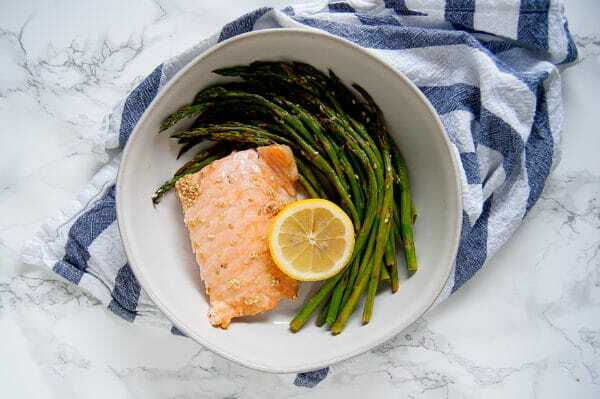 I recommend leaving the salmon in one large fillet, but if you choose to cut into individual portions it will require less cooking time and the asparagus will be more crisp. You can leave the salmon skin on or off - whichever you prefer. Leftovers may be refrigerated up to 48 hours in an enclosed, airtight container.